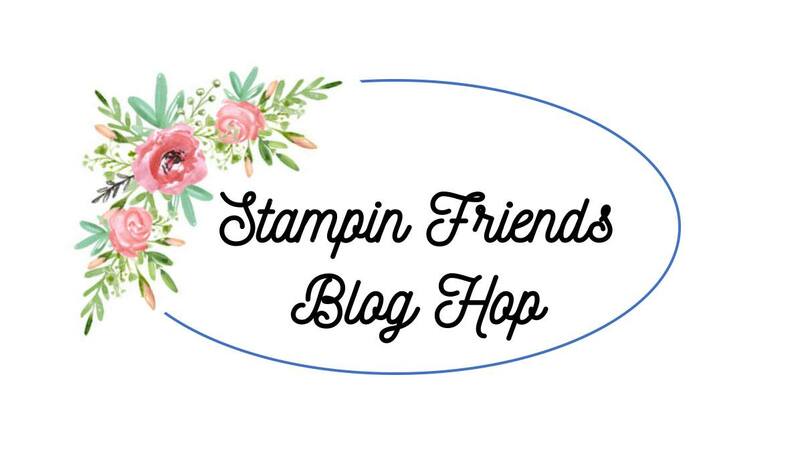 Stampin' Friends All about Love Blog Hop! 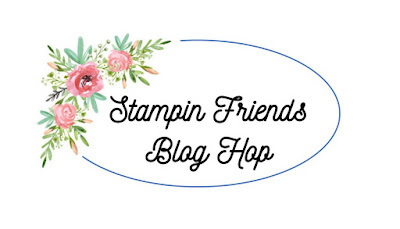 Good morning and welcome to the January Stampin' Friends All about Love Blog Hop! So, I'm sort of dedicating this blog post to my sweet niece Lauren and her soon to be husband, Ben. I have not had the pleasure of meeting Ben yet, but if Lauren picked him, he must be special. They met while in Bible college in California. Lauren is actually Rev. Lauren Waldroff! Since this hop is "All about Love" what more could I ask for to inspire me- a young couple in love, preparing to share the love of God with the world together! While visiting with Lauren and her family last weekend, she mentioned her wedding colors were pretty much black and light pink. Wham! Petal Passion Memories and More card Pack popped into my head! Love this accessory to the Petal Passion suite! As you can see I added a few other elements. I love the new stamp set Hold on to Hope and the thinlets set in the Sale a Bration catalog- Celebrate You! The wedding is not until June! Do you know how hard it will be for me to keep this under wraps until then? Okay now we need a matching card to accompany this work of art! Viola! I decided on a double Z-fold card continuing with the Memories and More card pack. I just love this stamp set and coordinating products! I hope you have enjoyed these projects as much as I have. Please leave me a comment and let me know what you think. You also will want to continue on the Blog Hop for some more great inspiration from some very talented ladies. Thank you for stopping by Stamping in Dixie. come back later this week for more details on these projects. Have a great day and be blessed! Are you scratching your head at the last post- the one I just posted? I debated going ahead and sharing it, but really loved the whole post and decided, "What the heck"! I wrote that post and thought I had scheduled it for Friday before Christmas. Obviously, I have been MIA from the blogging world for a couple of weeks. I just today realized that the scheduled post did not in fact post as it should have. I'm certain this was a user error (mine), but just thought I'll go ahead and share it anyway! So, enjoy a little before Christmas stamping almost 3 weeks later! So HAPPY 2018! I find it hard to believe it doesn't seem that long ago we were worrying about Y2K! It's been 18 years! 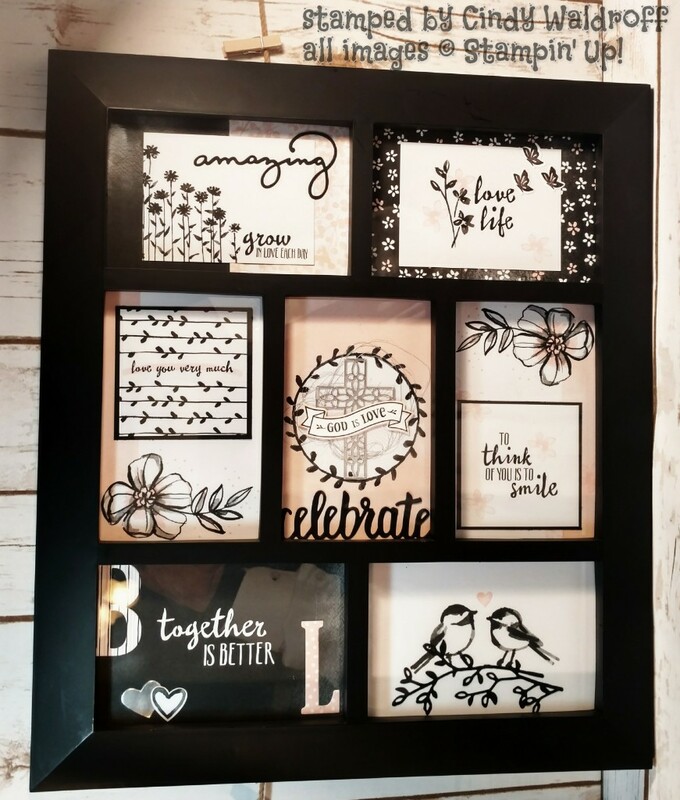 Stamping Up is celebrating their 30th anniversary this year which is a pretty big deal in the crafting world. We thought 2 sisters in their living room would created a company that 30 years later would be know world wide! But you can't even imagine the impact this company has had on the lives of so many women and families. 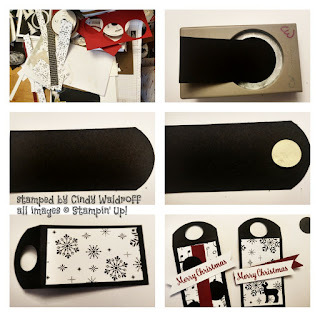 I have been blessed to be with Stampin' Up! for 11 years now. I am amazed at that fact I still get excited when a new catalog debuts! Drumroll!!!! Have you seen the new 2018 Occasions Catalog? It has 15 BUNDLES! It is amazing! and on top of that it's Sale-A-Bration time. Y'all it doesn't get any better than this! Oh wait, maybe it does. Check out this promotion. You can click the banner and go to the Paper Pumpkin site. Do it today and you will get the January kit with 16 projects to create for Valentines! Thank you for hanging around with me for another year. 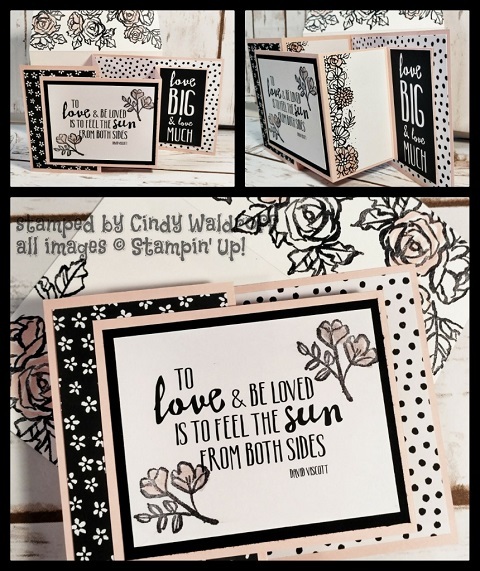 I hope you find some inspiration at Stamping in Dixie or maybe just get a good laugh or two. If you have any questions I'm here to help. Here's hoping and praying for a great new year for each of you and your families. Touch those around you this year. Let's spend some cheer one card at a time! Cute scraps and Moose Munch! Well, I'm hitting the floor running every waking minute these last few days before the Big Day! Today is Tombo's (DH) work party. I got up at 5:30 to make an amazing Cranberry Christmas cake. It is so easy and so good. 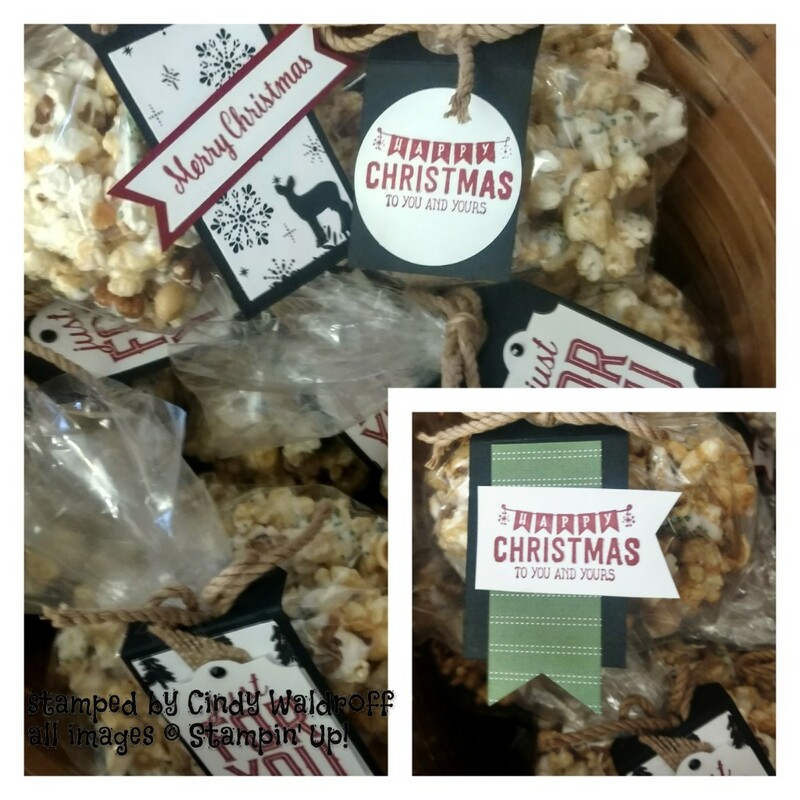 I also made 15 bags of Moose Munch for him to place in each co-workers stocking today and wrapped a Dirty Santa gift! It's been a busy morning. 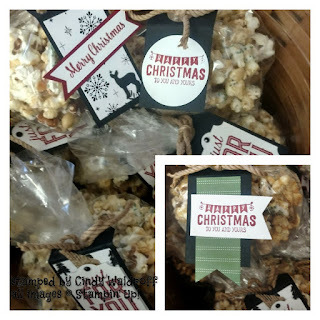 After bagging the Moose Munch, which is really caramel corn with peanuts and pecans drizzled with white chocolate and green sugar, I decided they need a cute tag of course. So I sat here and designed the cutest tag out of the pile of scrapes on my table. I kid you not the pile of scraps is huge! It was actually a lot of fun. I do kind of enjoy the challenge of working with somewhat limited supplies. It isn't quite as overwhelming as everything in my craft room. This first photo is a step by step of the process I use to make the tags. The bottom one is the basket of the finished projects! I used the 2" circle punch to round the end of the tag and a 1" circle punch to punch the hole in the center. These are really fun for me and I enjoy creating this type of projects for my Christmas gifts. I pray as you prepare for the Christmas season, you will take the time to reflex on the the greatest gift of all- Jesus Christ, God's Only begotten son. As much of the world celebrates His birth at this time, don't miss the wonder of God's gift to mankind.